Curiosity, the Mars Science Laboratory mission's rover, along with the mission's descent stage, arrived at NASA's Kennedy Space Center, Fla., on June 22, 2011, aboard a U.S. Air Force C-17 transport plane. PASADENA, Calif. -- NASA's next Mars rover has completed the journey from its California birthplace to Florida in preparation for launch this fall. The Mars Science Laboratory rover, also known as Curiosity, arrived late Wednesday night at NASA's Kennedy Space Center aboard an Air Force C-17 transport plane. It was accompanied by the rocket-powered descent stage that will fly the rover during the final moments before landing on Mars. 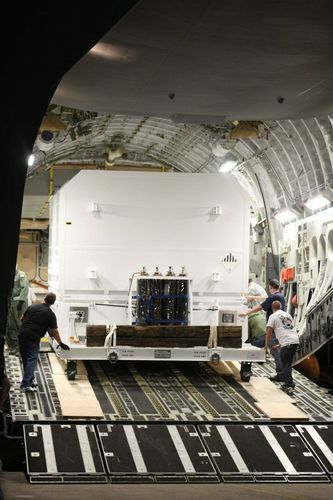 The C-17 flight began at March Air Reserve Base in Riverside, Calif., where the boxed hardware had been trucked from NASA's Jet Propulsion Laboratory in Pasadena, Calif.
JPL built the rover and descent stage and manages the mission for NASA's Science Mission Directorate in Washington. Launch management for the mission is the responsibility of NASA's Launch Services Program at Kennedy. The California Institute of Technology in Pasadena manages JPL for NASA. For more information about the mission, visit: http://www.nasa.gov/msl . To follow the mission on Facebook and Twitter, visit: http://www.facebook.com/marscuriosity or http://www.twitter.com/marscuriosity .